It would be nice if there was a simple/cheap remote control that would start/stop the camera via the 8pin remote connector - I haven't come across one yet. The cheapest option - the RMB-150 is $US2000 approx - but it does much more than just remote roll the camera - Iris (if you're using a suitable lens), Master Black, Gain, Paint controls - menu access etc - all useful stuff if you're not able to be hands on the camera, or using it in a multicam OB type scenario. The fact that Sony include this remote connector on the EX-3 is awesome - and the same remote (RMB-150) can control my PDW-700, PMW-350 and a few others as well! Thanks for your reflector clearification. I did something like that myself as well. But is's not the solution I look for. Also in your configuration it will be a hassle if you want to change lens etc. And even if you manage to create something sturdy that can stay in place when moving through the bushes and changing lenses, there still is the problem that you have to point the IR remote in the right direction. And find a way to hang it on a rope or so, attached to the camera, in order not to have to search for the thing all the time.I just want to concentrate on my kinfisher, so to say. Not on my start/stop remote trigger. I also trully believe that the RMB-150 is a valuable item, but not for me. I just want a cable with a botton to push. I find it remarkable that Sony delivers such a good camera and that there is no solution for a decent remote cable. For whoever is interested, I think I will try to solve this problem through the nano now. At least there is nice remote cable available for the nano of less than 100 USD, which I already use. I was trying the other way in this thread however (remote cable for the camera), because the nano route creates another obsticle for me. See my thread in the nanoflash forum. I understand your “kingfisher” problem as I am interested in similar projects. Basically I was trying to make the point with my pictures that there are simple solutions that can be very crude. In practice I have a holder for either a reflector or an infrared emitter that slips into the front accessory shoe so lens changes do not affect anything. I also use a very quick to adjust lens support that only uses one tube. This tube also serves as a rough sight for long lenses and as a potential support for hand holding. Another useful modification is a more powerful lens for the viewing screen. The infrared extender I use was made from a $25 kit. The extender is designed to take IR signals through walls etc and the output cable can be longer than I use. As I am one who is prone to tripping over cables I appreciate the fact that the IR emitter does not have to be plugged into an expensive camera set up on a tripod. I intend to add to my IR controls. I have an idea for a very simple push button focus control and also for a simple remote controlled head. There are a lot of delicate toy helicopters around that use multi channel IR controls. Give one of these to a young boy and you become a hero. When it is broken a few minutes later you can take it home and salvage the electronics. Is the IR extender the the black box with the red sensor, below your camera? Does it work on batteries? An extender permanently connected to the tripod could be a solution. Especially if it were possible to arrange a one-big-button-remote that has the right signal to trigger the camera. But i suppose i am asking too much. Still believe that a cable with button is the most perfect, reliable, simple, rigid solution, especially since there is a remote connection at the back of the camera. And what about the lens for the viewer. Can you tell me more about that and to what extend it is an advantage? Yes, the extender is housed in the black box with the red window. It runs on a 9 volt battery. It could be made more compact if it was supplied by the camera battery. The system works like this - the extender detects the signal from the Sony remote and transmits a copy of it to the sensor on the camera i.e. it “extends” the range of the Sony remote or many other remotes as well. (This is why I want to try the toy helicopter infrared electronics for functions like focus and camera position). The extender’s transmitter is an infrared emitting diode and it can be placed at the end of a cable (as I have done) to extend the range further or to take the signal through materials that infrared normally does not pass through such as walls. To control the camera the infrared signal just has to be directed towards the camera’s sensor - no hard to find plugs are required. The lens I use on the viewfinder magnifies the image more than the lens provided by Sony. Its magnification is nearly twice as much and I find it makes focusing easier. However it is not as easy to see into the corners of the screen. The lens was intended to boost the magnification of a dissecting microscope and has a focal length of about 100mm. 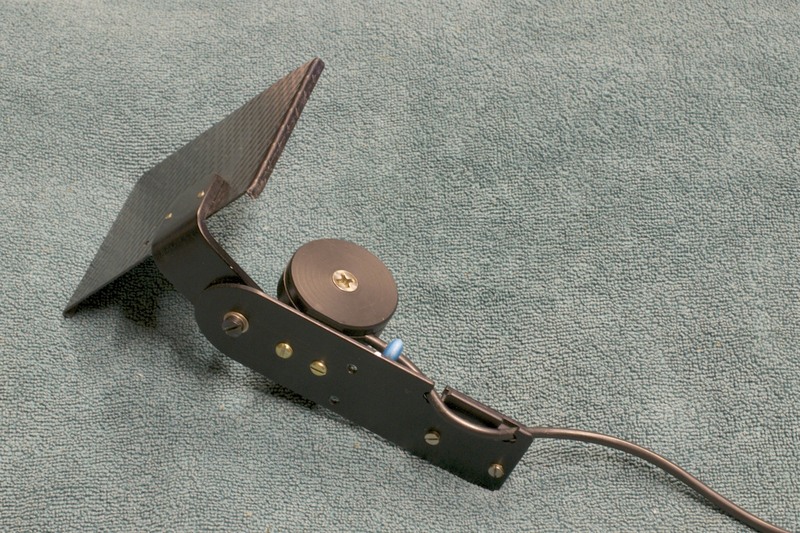 The Infrared extender kit I mentioned above was designed to be used on TV sets etc. The fact that it works with the Sony remote makes me wonder whether a learning type TV remote could “learn” the Sony remote signal(s)? Has anyone with a learning remote tried the experiment and if so can the camera be started by pressing just the one button and turned off by pressing another? Very interesting question Alistair. Hope someone ever tyried it, otherwise I may take the shot myself one day. thanks by the way, for your input. I have come late to this, as I have just replaced my trusty V1E with a nice used EX3, which came complete with a Manfrotto 521. I thought I was all set until I discovered that this fitted only the remote socket on the lens. Like others in this thread I am going to be using my camera with Nikon telephoto zooms, and the rather nice Fuginon will stay in a case. I have considered the various suggestions in the thread and eventually come up with what seems to me to be a cunning plan. The supplied IR remote can be opened up very easily (surprise, surprise), and the IR transmitter diode is accessible. I plan to buy a cheap remote from E-bay (£13) to experiment. My plan is to disconnect the diode from the PCB, and re-attach it with a lead which will reach to the front of the camera. I shall mount it on a bracket which fits into the front cold shoe. I hope that with a little adjustment I can achieve operation with the modified remote. 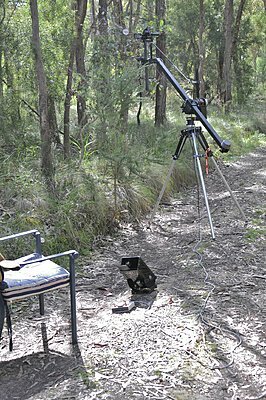 I shall then arrange a means of attaching my modified remote to my tripod pan-bar, and away we go! At, least that is the theory. I should be interested to know if anyone else has tried this, and if it works. The key seems to be, how critical is the position of the transmitter, and will it work close up to the sensor. Sounds like an interesting cunning plan. As mentioned above I have done something similar but without attacking the supplied remote. Instead I use an ‘IR extender’ that has the infrared emitter on the end of a lead. In my fiddling phase I found that the lead could be at least 30’ long. I found it convenient to place the emitter an inch or so from the camera sensor and made a simple bracket that slipped into the EX3 accessory shoe to support it. I also found that I could use a Panasonic TM900 with the same IR extender. As the Panasonic uses different signals to the EX3 it is possible to connect two leads to the extender and control each camera with their respective remotes. If you only want use the remote on the pan handle you could probably get away with mounting a reflector in front of the EX3 sensor to collect the radiation from the remote. There is nothing very critical about the reflector – aluminium works well. I cannot source a reasonable priced IR extender like yours in the UK. I have ordered a second IR remote to experiment. I will post when I have some results. This may be some time off as I am about to go on my annual migration to New Zealand for the summer! I now have a functioning remote control on my tripod pan bar! At the moment this is jury rigged with 4 feet of lightweight speaker cable between the IR diode and the remote. This can be readily adjusted at the remote end. The positioning of the diode in front of the IR sensor does not seem critical. What I plan to do is attach the transmitter to an aluminium strip or tube which is mounted on a cold foot fitted into the front cold shoe. Copper tube may be better as it is more malleable. I am not intending to teach egg-sucking with this over-detailed account, but this was straightforward for me as I am a retired teacher of electronics. Despite this, to avoid accidents, I did exactly what I describe. IR diodes are sensitive to over-heating, so be careful with that soldering iron. If you attempt this take great care, especially over polarity! Remove the battery from the remote first. Remove the two screws that hold the clam-shell case together. With a little juggling the back can now be removed from the case. The PCB/switch assembly is not fixed in the case and can be simply lifted out. The diode is attached by two soldered joints at the leading edge. To remove it you must have a miniature low-wattage soldering iron with a very fine bit. I used a 25 W thermostatically controlled iron with a pointed 1/16" bit, which I cleaned first. Before you attempt this make absolutely sure that you have the polarity of the diode sorted. There is a diode symbol on the component side of the PCB. I copied this with felt-tip pen onto the reverse side. I then wrapped a thin strip of insulating tape around the diode with the fold at the anode side of the diode. You really need three hands for the removal of the diode, but judicious use of Blu-tak worked for me. I held the body of the diode between the finger nails of one hand and applied the iron with the other, alternating between the diode leads, with a time gap between each application to allow the diode to cool. As I applied the iron, I squeezed with my fingers to pull the diode away from the PCB. It took several applications before the first side came free, the second was no further problem. Be very patient here! Replacement IR diodes are quite cheap, but you need to know the waveband for matching to the transmitter. I used a length of lightweight speaker cable intended for use in a car for the extension lead, selected because one lead is marked by a black stripe. Put a short length of heat-shrink sleeving over each lead at the diode end to avoid short circuits, and then carefully solder the diode to the cable. I connected the anode to the black stripe, but that is not important - so long as the other end is connected to the PCB the correct way round. . I removed the tape from the diode and cleaned the housing with a cloth dipped in propanol. Re-assembly of the remote is simply the reverse of taking it apart. Depending on the size of the cable you use, you may need to file the hole where the diode was to take the larger cable. In the UK IR remotes are available on E-bay for around £12, so there is not much to lose. Thanks for posting Alan, I have now moved from the ex3 to the PMW 300 which has the same arrangement for remotes as the EX3, but unlike the ex3 it does have a remote sensor at the rear. Luckily I ended up with 2 remotes for this camera, one of which looks like its soon to be modified! A further discovery - the IR transmitter diode does not need to be pointed straight at the receiver. It works perfectly well sideways, so I only need to have a 90 degree bend in my tube, rather than the 180 degrees I expected. I have attached some photos of my IR control set up for the EX3. 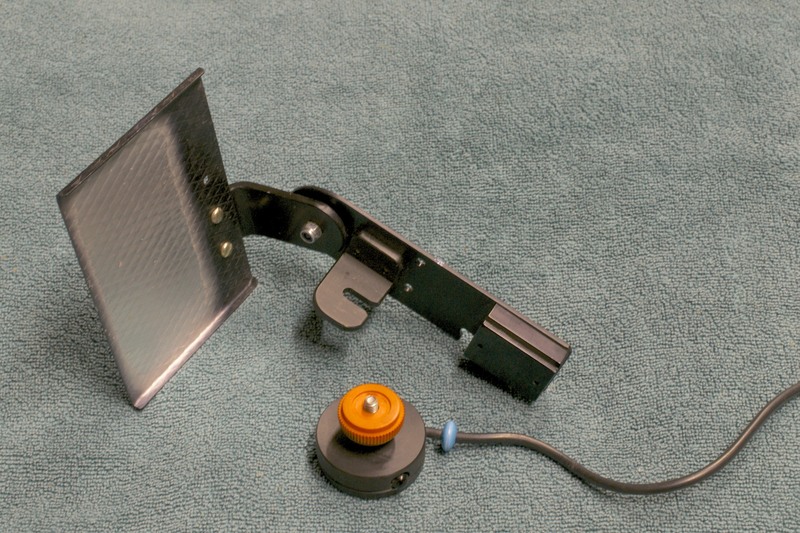 The first shows the mounting bracket with a reflector. It attaches to the camera accessory shoe. The other object is an IR emitter set in a delrin block so that the emitter is pointing at the EX3 sensor. If I am standing by the camera I just use the supplied remote (unmodified) and direct it towards the reflector. As it is not attached to the tripod there is less chance of knocking anything. If I am working at a distance I attach the IR emitter to the mounting bracket and use my IR extender. 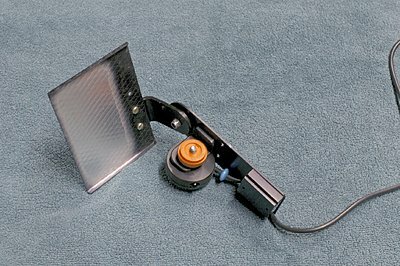 I have built an IR extender into my DP6 monitor set-up that can be seen on the ground in front of the chair. 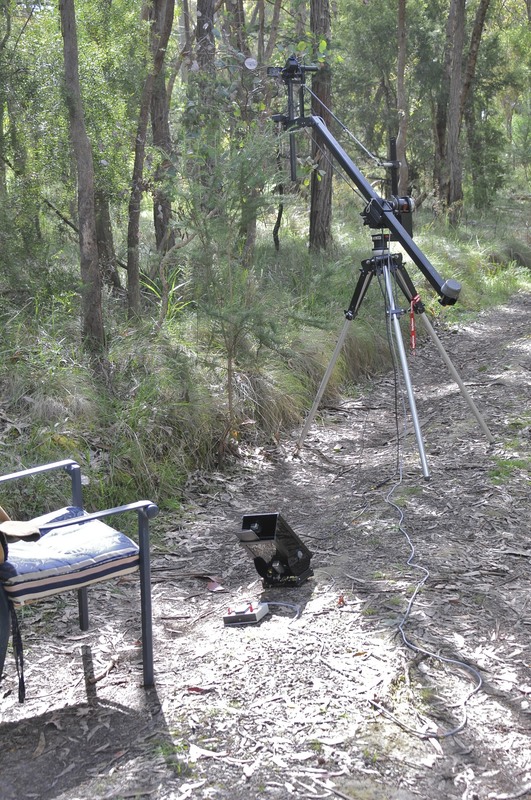 The final shot shows a Panasonic remote lying on top my tripod head control box. 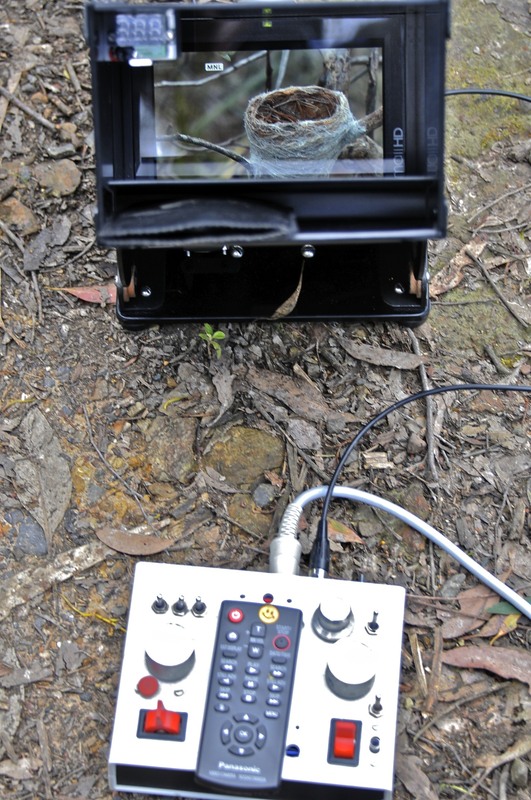 The DP6 shows a grey fantail nest under construction. Great set up Alastair. Your engineering and electronic skills never cease to amaze me.